Scott Bubar is accused of aggravated attempted murder of a Kennebec County sheriff's deputy during a 2017 shootout in Belgrade. 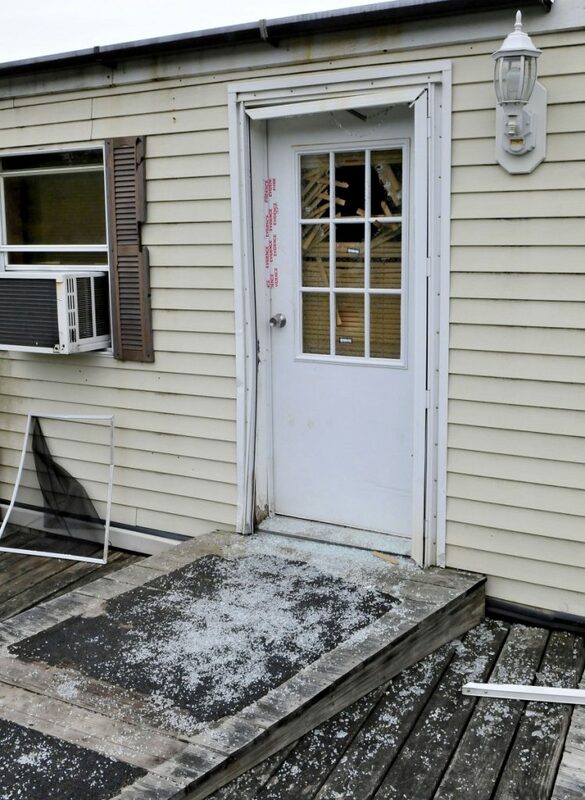 AUGUSTA — A judge this week heard testimony about shotgun shells, pellets, broken glass, DNA and other evidence collected from the scene of a May 2017 shootout in Belgrade. The nonjury trial of Scott Bubar, who is accused of aggravated attempted murder of Kennebec County Sheriff’s Office Deputy Sgt. Jacob Pierce and reckless conduct with a dangerous weapon, picks up for a sixth day Wednesday at the Capital Judicial Center. Bubar, 41, of Brunswick, was shot and wounded by Pierce; and Bubar’s father, Roger Bubar, 65, was killed by Pierce in the exchange of gunfire late on May 19, 2017. A bedridden woman who also lived in the home was injured. Scott Bubar’s attorneys say their client did not fire the weapons found in Roger Bubar’s mobile home: a 9 mm pistol and a 12-gauge shotgun, both of which belonged to Roger Bubar. Testifying on behalf of the defense Tuesday was Heather Miller Coyle, an associate professor in the Forensic Science Department at Henry C. Lee College of Criminal Justice & Forensic Sciences, who also runs Identacode Consulting LLC, as a private firm. She said she analyzed DNA reports from the Maine State Police Crime Laboratory, which tested the firearms and other items recovered from the scene. Coyle said that she agreed with most of the conclusions from scientists at the state laboratory. However, she said that they had thresholds below which they could offer no conclusive data. “I can look at all data and see that those remaining alleles (DNA coding sites on a chromosome) do not match to Scott Bubar,” Coyle said. The state’s experts listened in the courtroom as Coyle testified. The defense maintains no evidence ties Scott Bubar to the weapons. And his attorneys have said he tried to get the firearms away from his father. From his hospital bed several days after the shootout, Bubar told investigators, on an audio recording played in court, that he tried to get his father to stop. The medical examiner testified that Roger Bubar’s blood-alcohol level was 0.163 and that tests showed he had measurable quantities of various drugs in his system, including clonazepam (an anti-anxiety medication), cocaine, morphine, ritalin or a byproduct and THC, the active ingredient in marijuana. He said his father fired several shots inside the trailer, one of which went close to him. When police knocked on the door that night — in response to neighbors’ complaints about tire noise and shots — Roger Bubar ordered them off the property. After Roger Bubar fired another shot, police returned fire, and Roger Bubar was struck in the leg, Scott Bubar said. Roger Bubar fired again, and both were hit in the return fire. Scott Bubar also said he feared guns and suffered from PTSD from an incident years ago: “I took a loaded gun from my parents twice when they wanted to kill themselves. I took it and buried it under the house.” he said. Monday’s testimony involved the collection of spent and unfired shotgun shells containing buckshot and bird shot, and defense attorney Scott Hess told the judge that no one in the trailer at 1003 Oakland Road intended to kill a law enforcement officer. There was also testimony about shots that had been fired inside the trailer prior to the arrival of police and about where some shots broke windows and the glass in the front door. Pierce testified last week that he fired two bursts of his rifle at the trailer, both times after hearing glass break and seeing the muzzle flash of a shotgun. Once he saw the flash in a bedroom window and once at the front door. He testified he saw a green shirt in the muzzle flash, and Scott Bubar’s blood was found on a green T-shirt recovered from the bathroom in the home about a month after the incident. Roger Bubar was seen several times that night in a red shirt, and he is wearing it as he lay dead on the hallway floor in several photographs offered at the trial. At one point, Hess held up a set of heavy curtains that had been on one of the bedroom windows and then showed photographs of curtains, one set with several small holes and one set with one, apparently made by the ammunition fired. 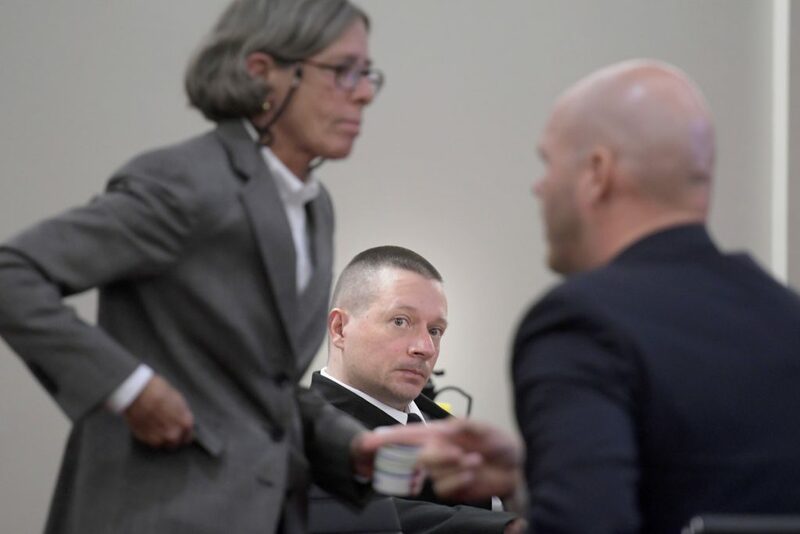 A number of law enforcement officers have testified about the event and the ensuing investigation, and Maine State Trooper Scott Bryant is expected to be the final witness for the prosecution on Wednesday. One defense expert has been scheduled to testify on Sept. 25.